A ship loader is equipment that is used for loading vessels continuously with coal, iron ore, cement,<br /> grain and other bulk materials. Ship loading equipment typically uses a belt conveyor in a continuous<br /> action to move bulk product from a dock conveyor onto the vessels. All ship loaders must be designed<br /> to load different sizes of ships that will berth at the port. A ship loader is equipment that is used for loading vessels continuously with coal, iron ore, cement, grain and other bulk materials. Ship loading equipment typically uses a belt conveyor in a continuous action to move bulk product from a dock conveyor onto the vessels. All ship loaders must be designed to load different sizes of ships that will berth at the port. This ship loader uses a travelling movement and incorporates a shuttle type of conveyor and a luffing feature to allow movement in three axes so that the ship loader can efficiently load many different sizes of ships. 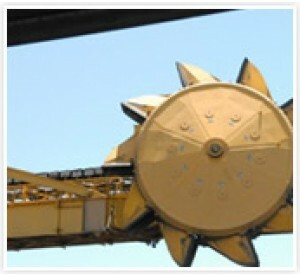 The ship loader also has a chute and rotating spoon arrangement for directing the bulk product into the different areas of a ships hold.